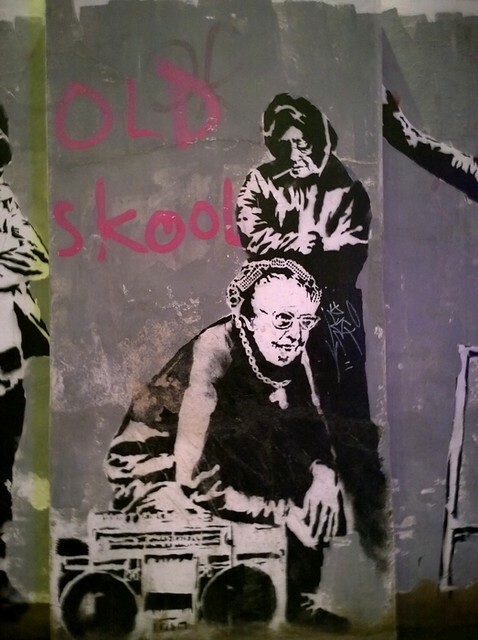 It’s not often a piece of street art produces a profound shift in my thinking but now I’ve seen the “Stealing Banksy?” exhibition, I get why Athenians insist that inside the British Museum is not the right place for the Elgin Marbles. Stealing Banksy? is part of a process whereby street art works by Banksy are being laundered through some weird kind of “preservation for the public” display exercise before being dispatched down the path always intended by the removers – making a buck for someone (other than Banksy). To be a bit clearer, the works of vandalism created on public property by Banksy, well ok, eight plus the Silent Majority on the side of a trailer done with permission and the not-for-sale "Brace Yourself" done in a deal with a band who were formerly known as "Exit Through The Gift Shop", were taken from their original location, restored, put on display to the public for 3 days in this exhibition (£20.00 on the door, no cameras) then auctioned to the highest mug - opps, sorry - bidder over the next few days. What will visitors see and is it really street art? 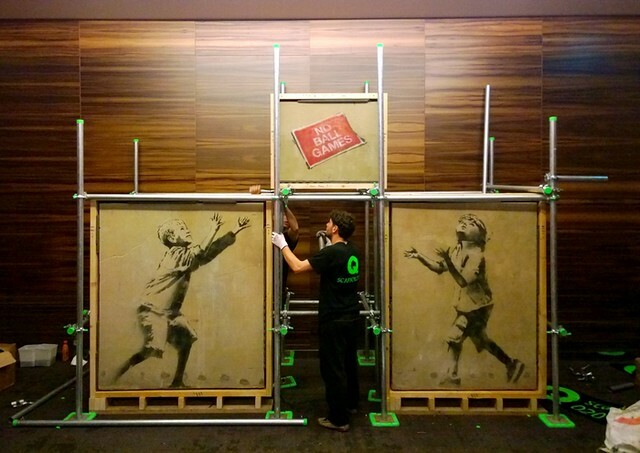 On Thursday Sincura Grouop held a press conference which included seven Banksy street art pieces and the slightly comical live assembly and unveiling before our eyes of the “No Ball Games” piece, featuring a lot of challenges reconstructing the top section. 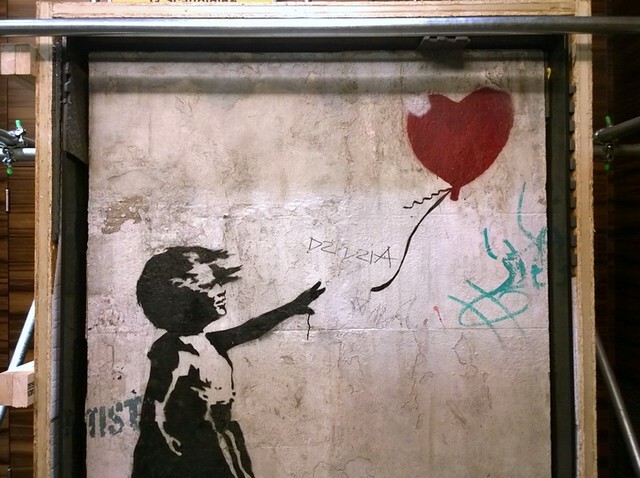 On Friday, two more pieces had been revealed, the “Girl With Balloon” and the “Boy with Heart” (Banksy and Faile) making a grand total of nine pieces on display. The tenth piece, the Liverpool Rat is described as needing refurbishment but it would have taken something rather larger than a single story indoor room to display. 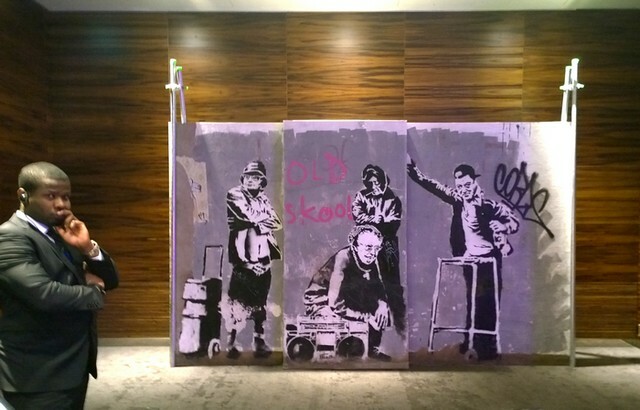 Are these pieces actually Banksy? 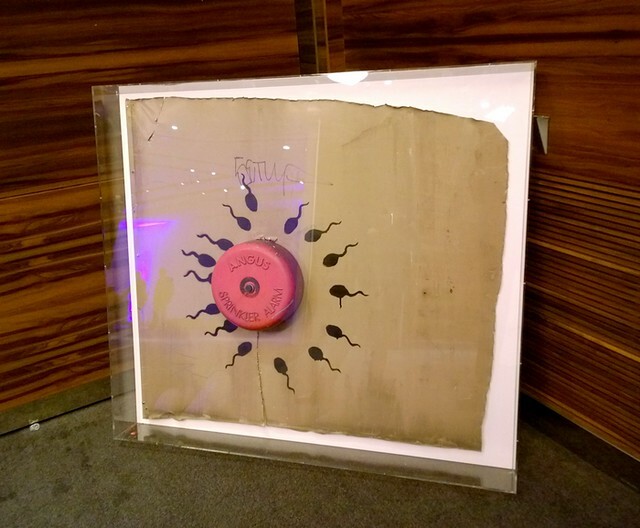 Well, the organisers only identify one of the pieces, the Silent Majority, as having Pest Control provenance, Pest Control being Banksy’s company that certifies works as genuine Banksy. This difficulty with lack of proof of the artist has always made reputable auction houses loathe to handle Banksy street art. I have speculated that Banksy had an ulterior motive to derail this exhibition when he created new street pieces that appeared in Bristol and Cheltenham two weeks ago. 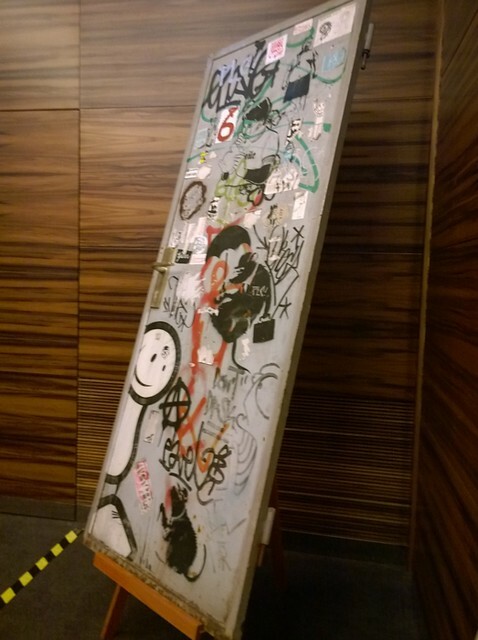 As for it being street art, shifting it indoors has a traumatic effect on the look and feel of these street pieces. Gone is any sense of the relationship they had to their environment. 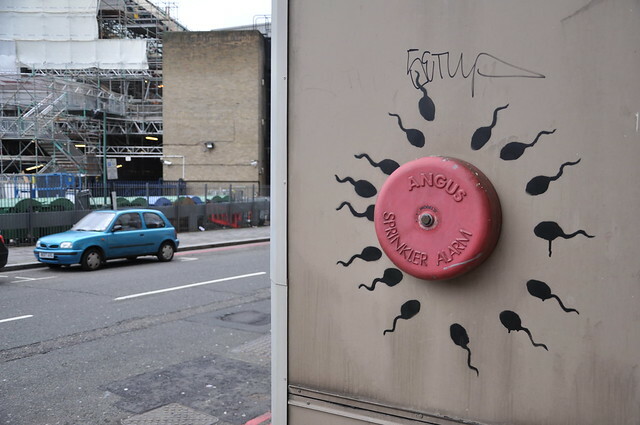 Admiration for the vandal taking risks to create this piece – the “Wow, how did he get away with that?” factor is completely absent. In short, they don’t feel at all like street art. They actually look completely out of place in this situation and one would hazard in any indoor location. The Berlin door raises the question “doesn’t this rat actually look a little bit silly”, I’m afraid the rats actually come across as rather infantile, which may be what Banksy intended though the impression is magnified hugely by the change of context from urban strasse to moodily lit showroom. No art historian is ever going to laud the artistic genius of our favourite vandal based on this evidence. What is the impact of the “restoration” that takes “9-12 months” ( per “Liverpool Rat according to the Stealing Banksy's "The Banksy Bugle" publication). Compare the photos I took of this detail of Tottenham’s No Ball Games, the restoration actually doesn’t look too heavy handed. A light dusting of the stains outside the stencilled portions and a bit of cleaning of the shadow between the chin and the ear looks like about the extent of the difference between the “as painted” condition and the restored condition, though the painted blob just behind the ear seems to have become curiously more emphatic over time! 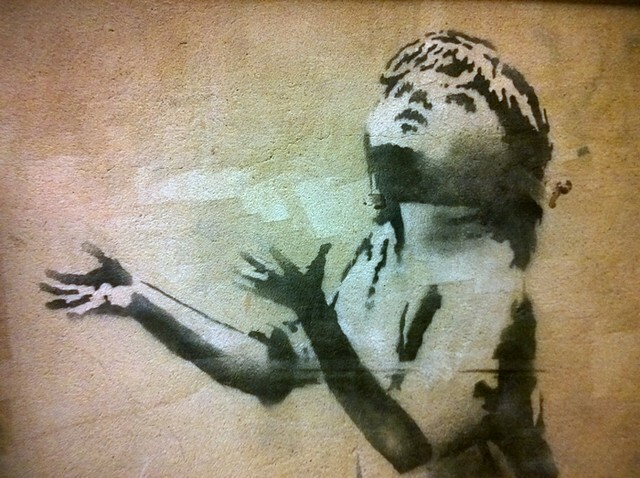 however a photo on the Stealing Banksy website suggests that at the start of restoration it was in appalling condition. That condition was its natural state given its location, lifespan and history, Sincura would have us believe that terrible condition is exactly the justification for saving and restoring the piece. The question is what right do they have to make that judgement? 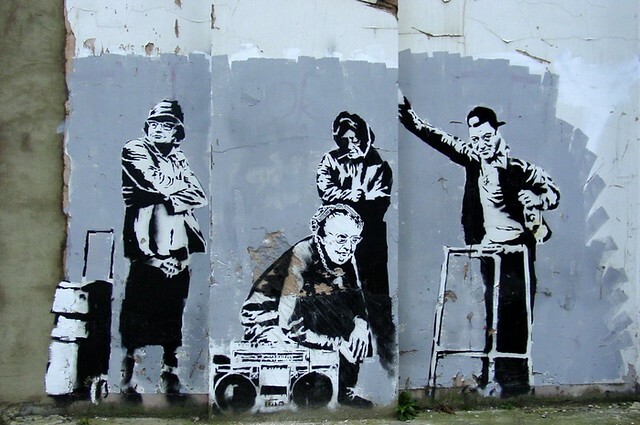 The Old Skool piece painted in 2005 (“The Banksy Bugle" – 2006) was originally captioned “Thugs For Life” by Banksy and didn’t feature the grey rollered background. This 2006 photo shows it with the grey background but lacking the “Old Skool” that was added later. Thugs For Life, 2006 - in between captions! Compare the flaking damage in 2006 on the right side and across the chest of the seated granny with the restored version now. A curious aspect of this “restoration” is that at the time is was removed, apparently after paying the wall owner a mere £1,000, the restorer Tom Orton described the restoration process in the press as involving peeling the 0.25mm thick layer of paint off the wall. In other words, they didn’t take the wall material. In fact, distinguishing features of the wall such at the crack on the buttress that ran horizontally through the nose of the central standing granny are STILL present on the original wall on Clerkenwell Road. In which case, exactly what is the wall on which Thugs For Life is now mounted? Did they take a mould of the wall surface? Whatever they did, the piece is not mounted on its original surface, how can this possibly be regarded as a Banksy? The Great Eastern St Girl With Balloon was in appalling condition back in 2004, Sincura's own film of its removal shows at 21 secs that it had deteriorated in the 10 years it was hidden behind wooden cladding. Its present condition amounts to little more than a repaint. 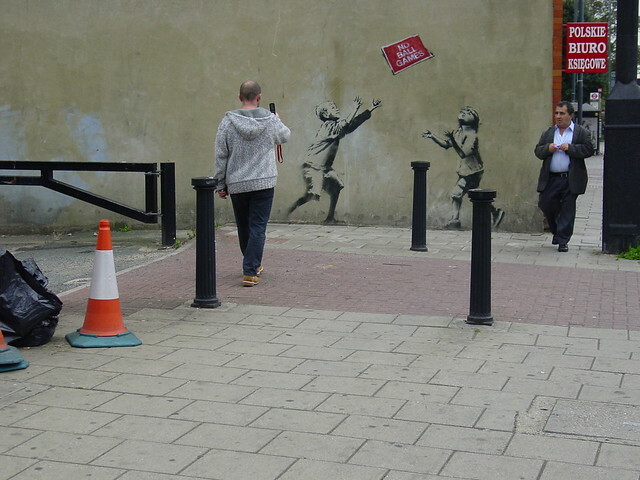 While we are on it, The Banksy Bugle says there were 2 "Girl With Balloon"s executed in this area, there were at least 4! These "restored" pieces bear as much relationship to the original Banksys as a Madame Tussauds waxwork of Lennon and McCartney does to actually being the most brilliant music composers and lyrists of the 20th century. The organisers have a website which smears a veneer of mitigants, excuses and basically layers of ambiguity and smokescreen over their involvement in the process and the motives of the people on whose behalf they are selling. My friend RJ from Vandalog has done a brilliant dismantling of Sincura's public proclamations so no need for us to repeat it. 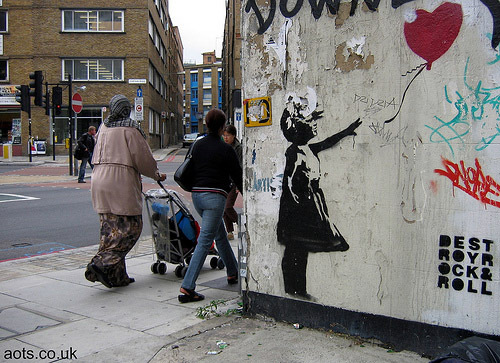 One thing to be added is that their claim that the Shoreditch “Girl with Balloon” was “long forgetten” is nonsense, we (author and several of similarly geeky friends) knew it was there, Banksy probably knew it was still there and clearly the building owners knew it was there. Their oft repeated mantra of “On the brink of being lost forever” is laughable, as if this was the Three Graces or some kind of national calamity or art world disaster! This art is meant to be ephemeral. At risk of getting a bit pedantic and trivial, both The Banksy Bugle and the Stealing banksy website are chock full of errors. There's a sort of trivia quiz, "10 things you didn't know about Banksy" and only one of them is supposedly incorrect they say. There's "5. 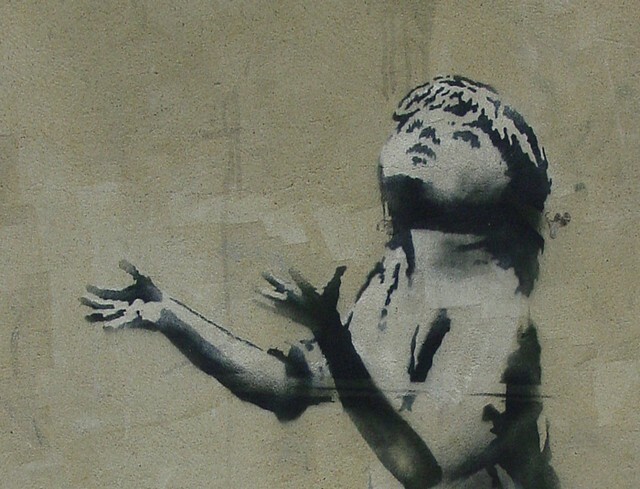 The Stealing Banksy? show in 2014 was actually commissioned by Banksy himself, through an anonymous company", seems unlikely. However, "fact" number 1 is "Banksy was behind a famous hoax in 2004, where photoshopped copies of Paris Hilton's album were distributed in HMV shops". There are three errors in that sentence alone, (2006, Banksy/Danger mouse remix CD, HMV & Virgin & independent record stores), so which of those two erroneous "facts" do you think they think is incorrect? The exhibition lasts until Sunday 27th and door admission is £20! Half of that is earmarked for charity but that steep ticket price is not exactly consistent with the general drift that the restoration, display and sale is tantamount to some kind of public service. At that price a family can save enough to buy the petrol for a trip to see the Banksy in Cheltenham with enough left over for a Little Chef burger. Don’t forget in London you can still see the brilliant “Shop 'til You Drop” in Bruton Lane behind Old Bond St too. Thanks to good friend Joe LdnGraffiti who sorted out access to the press conference and comps to go back and see the pieces after the rest had been revealed. Banksy has come away from the dirty nappies and dropped two sumptuous pieces in his old stomping ground; a.k.a. God’s own backyard, the West Country of England. Not surprisingly Banksy has never done anything in genteel Cheltenham before, as the local ‘krew’ consists of a spotty 14 year old called Tarquin, and his dad, Miles, who works in London and graciously comes home at weekends to practise [water] bombing in the 80 metre garden at their Regency townhouse. As is the norm these days early morning joggers spotted this intricate piece on Sunday morning (13th April) before the paint was dry, and although the tenant of the house didn’t quite know what was going on, she did go and have a look about 7.30am when the 3 ‘workmen’ who had erected a tent over the wall/phone box had just left. CCTV shows 3 people wearing high viz jackets, driving the ubiquitous white van, arriving at 6am. It’s on the side of a non-descript house where Hewlett Road and Fairview Road meet in a not quite as leafy area of Cheltenham [for those wishing to visit the postcode is GL52 6AJ, and the train station is less than 2 miles away]. The appeal of this particular house though was not only because its side wall is whitewashed and has a satellite dish on it, but also that it has a telephone box slap bang in front of it, and is on a high visibility mini- roundabout where 6 small roads meet. All perfect Banksy material. And finding a public phone box these days isn’t that easy you know! Being located in Cheltenham is obviously a nod to the huge Government Communications Headquarters building 3 miles away on the other side of town. More commonly known as GCHQ, this is the place where the UK government monitors global and national communications; i.e. where they spy on us all. GCHQ say they are keeping Britain “safe and secure” and when asked to comment on the art, even gave a pithy reply that “our website gives a glimpse of what modern-day intelligence operatives are really like, although some may be disappointed by the lack of trench coats and dark glasses”. Spending barely 15 minutes there this week was enough to make my ears bleed as I couldn’t help overhear the inane conversations of self proclaimed Banksy ‘experts’, a local Councillor, and a BBC news crew urgently called away from Mrs. Miggin‘s cat stuck up a drainpipe. The usual rent-a-quotes then came out in the written media to exalt its genius, or pillory its tired middle of the road message (delete as applicable to fit your own immoderate point of view). The truth of course is somewhere in between. It has a certain charm and the quality is undoubted, but then again since when did illegal graffiti or ‘street art’ involve a tent and 90 minutes of relatively stress free work. Its message may still be news worthy, but the piece is extremely tardy, as newspapers like the Guardian and the Washington Post were fearlessly reporting on US government electronic spying and Edward Snowden’s valiant whistle blowing since June 2013 and, in a peculiar twist of timing, were awarded a Pulitzer Prize the day after this piece went up. In a turn of events more significant than the Cheltenham piece, I have wracked my tiny brain, and I believe this is the first ever Banksy street piece to end up in a Museum. 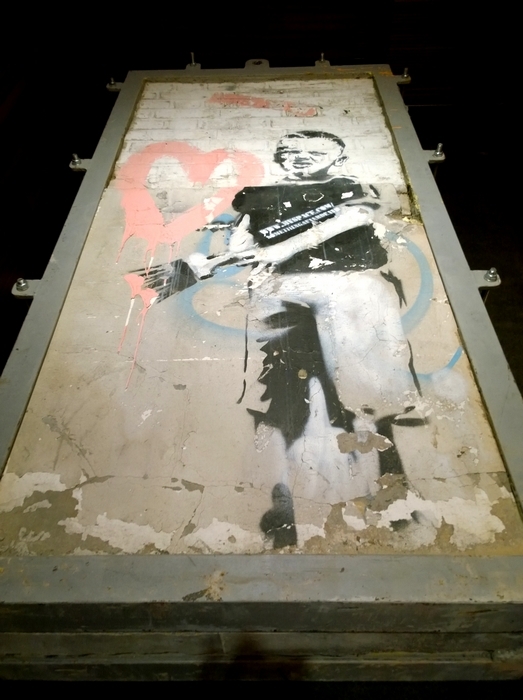 The first most people knew of Banksy’s second new piece (instantly known as 'Mobile Lovers') was when his web site was updated on Monday (14th April), and it mysteriously contained just two photos of a new piece and nothing else; not even one word. The only clue as to its potential whereabouts was that a double yellow line and a partially cobbled street suggested is was a section of rough old road somewhere in the UK. Yet it had been ‘found’ already and the location was made public on Tuesday morning. Although the piece was in a small dead end road (Clement Street), it overlooked the main dual carriageway into central Bristol from the motorway where thousands of motorists sit daydreaming in long queues every day. It was a classic Banksy location. High profile, yet simultaneously low profile, and particularly photogenic at dusk, with the street light, cobbles and barbed wire close at hand, making the piece resemble an illicit love tryst in a dark doorway. It was on a slab of board that was covering a old blocked up doorway next to the Riverside Youth Project. Staff from the Broad Plain Boy’s Club, the charity who use the Council-owned building, rapidly took the board off and into the club for ‘safe keeping’. Although Banksy pieces in his home town tend not to get dogged or stolen, I could understand this decision as the hype surrounding new street pieces has now reached intolerable proportions and this one was also easily nickable. The club’s CCTV show that this one took an hour, under another tent, on Sunday morning although that does raise questions of how he did 2 pieces in 1 morning and how the photo on his website was in the dark. CCTV suggests Cheltenham was done first and Bristol after, which means the photo of the Bristol piece in the dark must have been taken on Sunday evening. With indecent haste the club’s leader, Dennis Stinchcombe, claimed it for their fundraising activities and said they would approach Bonham’s ASAP to sell it, whilst also promulgating the theory that Banksy had ‘left’ it there deliberately to help them out financially. Later they stated they had received offers of over £1m for it. I doubt it, unless Mr. M. Mouse was calling them up from his padded cell in the toy town detention centre. A futile debate rapidly raged over ‘street art’ being taken out of context and ‘charged for’, whilst others said ‘calm down love, it’s only a painting’, and agreed it could help local Bristol urchins in this run down area, barely a stones throws away (admittedly by a very strong man) from where Banksy lived in the late 1990’s. True to their word the club had immediately let people gurn at the piece, in return for a small donation towards their undoubtedly good work. On Wednesday morning Mr Stinchcombe was still very bullish about their rights and when asked if they would hand it over to the Council if they asked for it he replied, “Definitely not. Not only that but we don’t get the grants from the Council anymore… if they want to come up with some good grants they can have it”. The old adage that possession is 9/10ths of the law is nevertheless total balls and whilst taking photos there on Wednesday lunchtime I witnessed a surprise visit from the Cops, who checked it was still there and gave polite advice about its uncertain ownership status. The elected Bristol mayor, George Ferguson, was apparently behind this and by the end of the day the clubs resistance had crumbled as it was handed over to more Police, who deposited it at the Bristol Museum, whilst the red trousered one declared that “It certainly would have been a cultural crime if this artwork had been lost to the City”. Yes, and last week was the 20th Anniversary of the beginning of the Rwandan Genocide. I’d hate to add up the uneven number of column inches these 2 ‘events’ have received. The mayor had a point though, even if he seemed rather heavy handed in his hyperbole and cries of ‘theft‘. It certainly seemed a difficult inference to accept that Banksy had meant this to be taken away and sold off within days, even if it would help a good cause. It went on display there yesterday (Good Friday), just in time for the resurrection. It will remain there until its future is decided, and if I were a betting man I would be wagering my kids that it will stay there. I just hope I don’t acquire more ear-shattering kids as my winnings though. Free entrance is assured at the Bristol Museum & Art Gallery, Queens Road, Bristol, BS8 1RL.